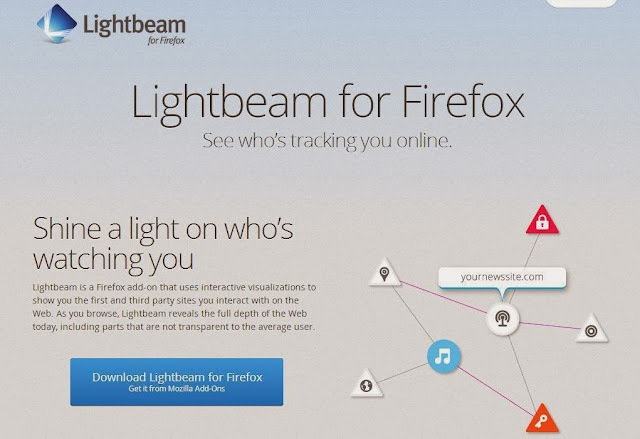 Lightbeam is a free Firefox browser extension that enables you to see the first and third party sites you interact with on the Web. 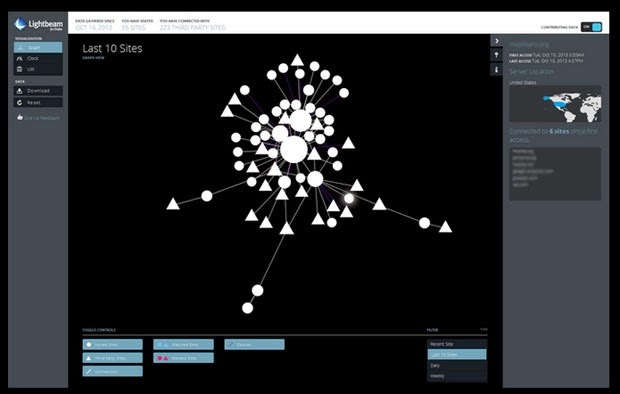 Using interactive visualizations, Lightbeam shows you the relationships between these third parties and the sites you visit. Using interactive visualizations, Lightbeam enables you to see the first and third party sites you interact with on the Web. As you browse, Lightbeam reveals the full depth of the Web today, including parts that are not transparent to the average user. 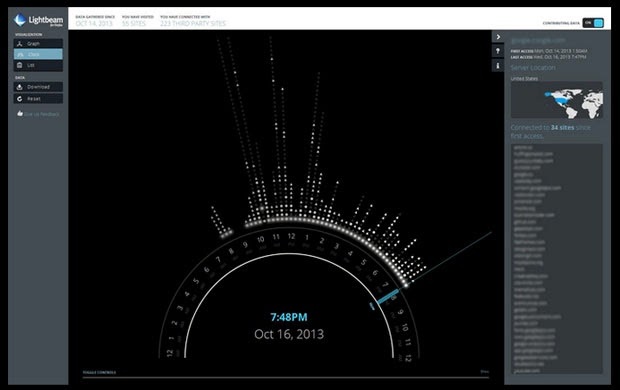 Using three distinct interactive graphic representations Graph, Clock and List Lightbeam enables you to examine individual third parties over time and space, identify where they connect to your online activity and provides ways for you to engage with this unique view of the Web. The aim of the tool, according to Mozilla, is to highlight the first- and third-party sites you interact with, including the parts of the Web that are hidden from plain view. Third parties typically place a small piece of code called a "tracking cookie" on your computer, which they use to watch how you bounce from page to page. Lightbeam allows you to take an in-depth look at how third parties collide with your online activity using three distinct visualizations. The Graph option displays an interactive representation of every website you've visited, and how various third-party services connect to each of those. The List view details the first and most recent times you interacted with a site; lists how many sites you've visited and the third-party sites you've connected to; and notes the number of connections each site you've accessed has with the others on the list. The Clock view allows you to examine the number and types of connections you've made with websites over 24 hours. You have the option of sharing your data with the Lightbeam database, which aims to build a wider picture of how first- and third-party sites intersect. Mozilla put the Lightbeam code on Github as an open source project, to let developers "hack, expand and improve" it. "It's important to provide users with transparency regarding cookies. That said, exactly how important it is for users to be aware of cookies depends upon the particular user," Alan Chapell, president of Chapell and Associates, told. "Some care a great deal about this stuff, while others don't care as much." 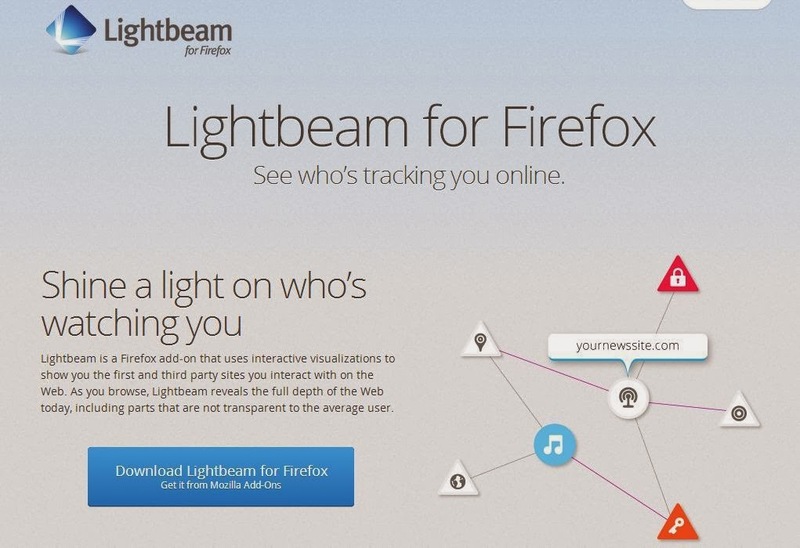 Lightbeam is the latest version of Collusion, a personal project created by Mozilla developer Atul Varma in 2011 to visualize user browsing and online data collection. Mozilla collaborated with students from the Emily Carr University of Art + Design to create visualizations for the browser extension. Lightbeam was funded by a grant from the Ford Foundation and the Natural Sciences and Engineering Research Council. One clear consequence of Lightbeam is that it may encourage Web users to consider their privacy online. Over time, third-party marketing firms can build a wealth of information about you, which they may then sell to advertisers. Those advertisers can then use that data to display ads targeted toward your interests and demographic. Third parties also could transfer data on your browsing activity to government agencies. "Potential dangers involve having your information spread out across the Web and in companies' databases that you don't even know about. You don't know how they're using such information," Adi Kamdar of the Electronic Frontier Foundation told. "We've seen stories where marketers end up predicting that someone is pregnant, for example, so they send information about their pregnancy, which is something that they or their family members may not know about," he pointed out. "This data can reveal sensitive political information about people," Kamdar observed. "Users should understand how their information is being used online," noted the EFF's Dan Auerbach. "However, it is also our role as technologists to ensure that people are protected automatically, and right now we are failing that with respect to user privacy." There are a number of steps you can undertake to prevent third parties from tracking your online movements. 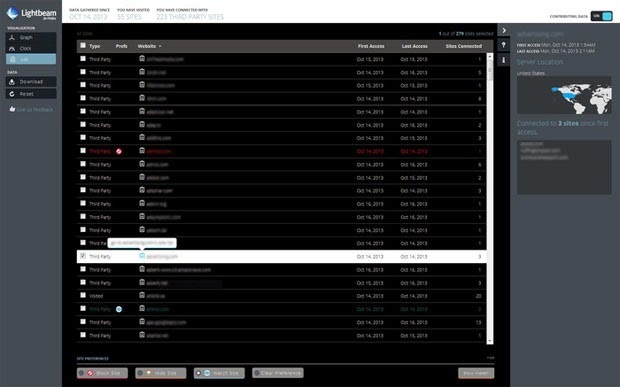 "Using something like Lightbeam is a great step to knowing exactly what sort of third parties are tracking you," said Kamdar. "There are some browsers that block these cookies and do a really good job of making sure these third-party requests don't happen without your consent. Some examples are Ghostery and Do Not Track Me." Users often can go to tracking companies' websites and opt out, he added. "Browsing histories contain incredibly sensitive information like personal orientation and financial information," said Auerbach, who noted ad blocking tool Disconnect as one way to block tracking cookies. Not all Web tracking is inherently intrusive. Cookies are often used to save users time by automatically filling forms and storing preferences. They're used to store items in shopping baskets on retail sites and to keep you logged in on your favorite social networks. Website owners use them to see how often you visit their domains for stat tracking. However, there aren't too many downsides to making third-party tracking requests more transparent to users, maintained Kamdar. "It reveals how pervasive tracking is on the Web. Once people realize going to a website gives your presence away -- not just to that website, but to 10 other parties -- they're going to be more privacy-aware and more aware of the circumstances of their Web browsing."